Sewall Green Wright (December 21, 1889 – March 3, 1988) was an American geneticist who was one of three major pioneers in the wedding of genetics to evolutionary theory known as the modern evolutionary synthesis (neodarwinism). This triumvirate—Sewall Wright, R. A. Fisher, and [[J. B. S. Haldane]—helped to establish theoretical population genetics early in the 20th century, which was a major step in the melding of classical Darwinism with the rediscovered Mendelian genetics, fusing two very different and formerly divided research traditions, the Darwinian naturalists and the experimental geneticists. Wright was the discoverer of the inbreeding coefficient and of methods of computing it in pedigrees. He extended this work to populations, computing the amount of inbreeding of members of populations as a result of random genetic drift, and he and Fisher pioneered methods for computing the distribution of gene frequencies among populations as a result of the interaction of natural selection, mutation, migration, and genetic drift. 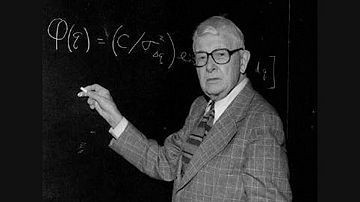 Wright also is known for his work on path analysis, a statistical method that remains widely used in social science. Sewall Wright was a Unitarian and after he retired in 1955 and moved from the University of Chicago to the University of Wisconsin, he attended church in the Madison area. Although Unitarians allow a great diversity in terms of faith, this outward expression of interest in spiritual growth reflects an interesting fact about some of the founders of the modern evolutionary synthesis. Although evolutionary biology is often thought of as the most atheistic of the sciences, some of the more prominent founding fathers were deeply religious or interested in spiritual matters. Fisher was a deeply devout Anglican, Dobzhansky was an ardent Christian, and Haldane was a mystic. Sewall Wright was born in Melrose, Massachusetts to Philip Green Wright and Elizabeth Quincy Sewall Wright. His parents were first cousins, an interesting fact in light of Wright's later research on inbreeding. The family moved three years later after Philip accepted a teaching job at Lombard College, a Universalist college in Galesburg, Illinois. Sewall Wright was the oldest of three gifted brothers—the others being the aeronautical engineer Theodore Paul Wright and the political scientist Quincy Wright. From an early age Wright had a love and talent for mathematics and biology. As a child, Wright also helped his father print and publish an early book of poems by his father's student Carl Sandburg. Sewall Wright attended Galesburg High School and graduated in 1906. He then enrolled in Lombard College where his father taught, to study mathematics. He was influenced greatly by Professor Wilhelmine Entemann Key, one of the first women to receive a Ph.D. in biology. Wright received his Ph.D. from Harvard University, where he worked at the Bussey Institute with the pioneering mammalian geneticist William Ernest Castle investigating the inheritance of coat colors in mammals. From 1915 to 1925, Wright was employed by the Animal Husbandry Division of the U.S. Bureau of Animal Husbandry (of the U.S. Department of Agriculture), when he joined the Department of Zoology at the University of Chicago. In 1936, Wright began collaborating with Theodosius Dobzhansky, who was part of the second phase for the modern evolutionary synthesis, particularly with his 1937 book Genetics and the Origin of Species, which biological historian David Hull states that was, more than any other book, "the work that initiated the Modern Synthesis and that successive editions "formed the bible of evolutionary biology." Wright continued to work with Dobzhansky, who was at Columbia University, until 1945. "Wright...could not have been more different from his British counterparts [Fisher, Haldane]. He was as gentle and unassuming as they were confident and demanding. ... He worked, married, had children, taught, raised his guinea pigs, and published. About the only excitement in his life was his famous feud with Fisher. The feud with Fisher began when Wright "criticized Fisher's theory of evolution of dominance" and "became increasingly polemical, by the late 1940s, their feud had reached legendary proportions." Wright received many honors in his long career, including the National Medal of Science (1966), the Balzan Prize (1984), and the Darwin Medal of the Royal Society (1980). He was a member of the National Academy of Sciences and a Foreign Member of the Royal Society. For his work on genetics of evolutionary processes-, Wright was awarded the Daniel Giraud Elliot Medal from the National Academy of Sciences in 1945. Wright married Louise Lane Williams (1895–1975)in 1921. They had three children: Richard, Robert, and Elizabeth. Wright died at the age of 98, after slipped on the ice during his daily long walk. Gould noted that he was "sharp as eve to the very end." Sewall Wright's papers on inbreeding, mating systems, and genetic drift make him a principal founder of theoretical population genetics, along with R. A. Fisher and J. B. S. Haldane. Their theoretical work is the origin of the modern evolutionary synthesis (also known as eodarwinism). Wright was the inventor/discoverer of the inbreeding coefficient and F-statistics, standard tools in population genetics. He was the chief developer of the mathematical theory of genetic drift, which is sometimes known as the Sewall Wright effect, cumulative stochastic changes in gene frequencies that arise from random births, deaths, and Mendelian segregations in reproduction. In this work, he also introduced the concept of effective population size. Wright was convinced that the interaction of genetic drift and the other evolutionary forces was important in the process of adaptation. He described the relationship between genotype or phenotype and fitness as fitness surfaces or fitness landscapes. On these landscapes mean population fitness was the height, plotted against horizontal axes representing the allele frequencies or the average phenotypes of the population. Natural selection would lead to a population climbing the nearest peak, while genetic drift would cause random wandering. Wright's explanation for stasis was that organisms come to occupy adaptive peaks. In order to evolve to another, higher peak, the species would first have to pass through a valley of maladaptive intermediate stages. This could happen by genetic drift if the population is small enough. If a species was divided into small populations, some could find higher peaks. If there was some gene flow between the populations, these adaptations could spread to the rest of the species. This was Wright's shifting balance theory of evolution. There has been much skepticism among evolutionary biologists as to whether these rather delicate conditions hold often in natural populations. Wright had a long standing and bitter debate about this with R. A. Fisher, who felt that most populations in nature were too large for these effects of genetic drift to be important. Wright strongly influenced Jay Lush, who was the most influential figure in introducing quantitative genetics into animal and plant breeding. Wright's statistical method of path analysis, which he invented in 1921 and which was one of the first methods using a graphical model, is still widely used in social science. He was a hugely influential reviewer of manuscripts, as one of the most frequent reviewers for genetics. Such was his reputation that he was often credited with reviews that he did not write. During Wright's employment at the Animal Husbandry Division of the U.S. Bureau of Animal Husbandry, his main project was to investigate the inbreeding that had occurred in the artificial selection that resulted in the leading breeds of livestock used in American beef production. He also performed experiments with 80,000 guinea pigs in the study of physiological genetics. Further more he analyzed characters of some 40,000 guinea pigs in 23 strains of brother-sister matings against a random-bred stock. (Wright 1922a-c). The concentrated study of these two groups of mammals eventually led to the Shifting Balance Theory and the concept of "surfaces of selective value" in 1932. He did major work on the genetics of guinea pigs, and many of his students became influential in the development of mammalian genetics. He appreciated as early as 1917 that genes acted by controlling enzymes. An anecdote about Wright, disclaimed by Wright himself, describes a lecture during which Wright tucked an unruly guinea pig under his armpit, where he usually held a chalkboard eraser: according to the anecdote, at the conclusion of the lecture, Wright absent-mindedly began to erase the blackboard using the guinea pig. Wright was one of the few geneticists of his time to venture into philosophy. He found a union of concept in Charles Hartshorne, who became a lifelong friend and philosophical collaborator. Wright believed that the birth of the consciousness was not due to a mysterious property of increasing complexity, but rather an inherent property, therefore implying these properties were in the most elementary particles. Wright and Fisher, along with J.B.S. Haldane, were the key figures in the modern synthesis that brought genetics and evolution together. Their work was essential to the contributions of Dobzhansky, Mayr, Simpson, Julian Huxley, and Stebbins. The modern synthesis was the most important development in evolutionary biology after Darwin. Wright also had a major effect on the development of mammalian genetics and biochemical genetics. Wright, S. 1984. Evolution and the Genetics of Populations. v. 1. Genetic & Biometric Foundations. Chicago: University of Chicago Press. ISBN 0226910385. Wright, S. 1984. Evolution and the Genetics of Populations. v. 2. Theory of Gene Frequencies. Chicago: University of Chicago Press. ISBN 0226910393. Wright, S. 1984. Evolution and the Genetics of Populations. v. 3. Experimental Results and Evolutionary Deductions. Chicago: University of Chicago Press. ISBN 0226910407. Wright, S. 1984. Evolution and the Genetics of Populations. v. 4. Variability Within and Among Natural Populations. Chicago: University of Chicago Press. ISBN 0226910415. ↑ 1.0 1.1 Gould, S. J., The Structure of Evolutionary Theory (Cambridge, MA: The Belknap Press of Harvard University Press, 2002). ISBN 0674006135. ↑ 2.0 2.1 2.2 D. L. Hull, Science as a Process: An Evolutionary Account of the Social and Conceptual Development of Science (Chicago: The University of Chicago Press, 1988). ISBN 0226360504. ↑ National Academy of Sciences, "Daniel Giraud Elliot Medal," National Academy of Sciences. Retrieved July 30, 2011. ↑ J. F. Crow, [http://www.genetics.org/cgi/reprint/119/1/1.pdf "Sewall Wright (1889-1988)," Genetics 119(1988), iss. 1: 1–4. PMID 3294096. Retrieved July 30, 2011. Crow, J. F., and W. F. Dove. 1987. Sewall Wright and physiological genetics. Genetics 115: 1–2. PMID 3549442. Retrieved July 30, 2011. Ghiselin, M. T. 1997. Metaphysics and the Origin of Species. NY: SUNY Press. ISBN 079143467. Retrieved July 30, 2011. Hartshorne, C. 2001. Darwin and some philosophers. Process Studies 30(2): 276-288. Retrieved July 30, 2011. Hill, W. G. 1996. Sewall Wright's 'Systems of Mating'. Genetics 143(4): 1499–506. PMID 8844140. Retrieved July 30, 2011. Orr, H. A. 1999. Gould on God: Can religion and science be happily reconciled? Boston Review October/November. Retrieved July 29, 2011. Provine, W. 1986. Sewall Wright and Evolutionary Biology. Chicago: University of Chicago Press. ISBN 0226684733. Wright, S. 1932. The roles of mutation, inbreeding, crossbreeding and selection in evolution. Proc. 6th Int. Cong. Genet 1: 356–366. Wright, S. 1986. Evolution: Selected papers. Chicago: University of Chicago Press. ISBN 0226910539. This page was last modified on 9 September 2015, at 15:45.